Minimum Cabin Costs Apply. 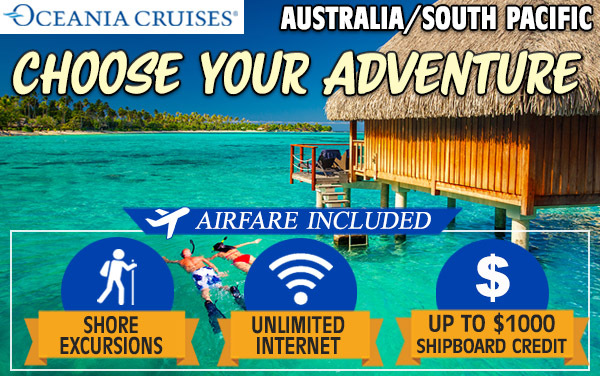 Not combinable with any offer including, but not limited to exclusives, onboard bookings, AMEX CPP Rates. Value Fares are not combinable with Pre-paid Gratuities. Included Airfare applies the following gateways: ATL, BOS, CLT, DCA, DEN, IAD, JFK, LAX, LGA, MCO, MDW, MIA, ORD, PHL, PHX, SAN, SAV, SEA, SFO, TPA, YOW, YUL, YVR. 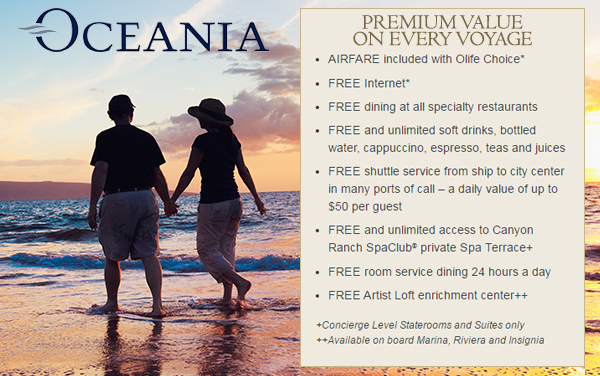 Guests in the same stateroom must choose the same OLife Choice amenity, and amenity must be chosen by final payment. Not all promotions are combinable. 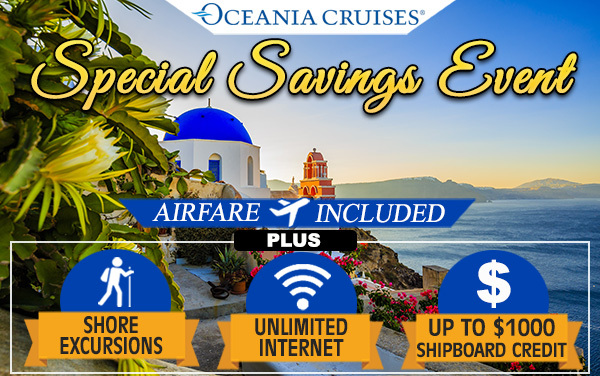 UNLIMITED INTERNET:Free Internet is one per stateroom; Owner’s, Vista & Oceania Suites receive access for two devices per suite. FREE HOUSE BEVERAGE PACKAGE: OLife Choice beverage package amenity is House Select. Unlimited Champagne, wine and beer with lunch and dinner. 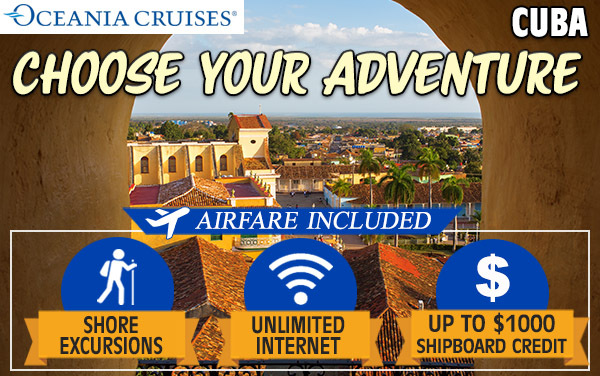 SHORE EXCURSION OPTIONS: There are multiple options to choose from for the free excursions. In any given port there will typically be at least two choices. The only excluded excursions are those that fall within our Choice, Executive or Exclusives selection. Excursions may be booked in advance. Credits will not be offered for non-use of the shore excursion amenity. 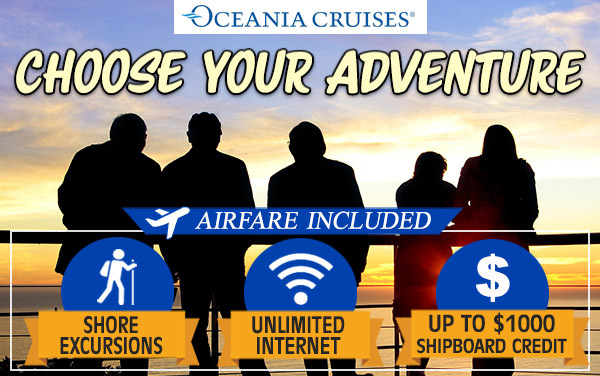 OLife Choice free shore excursions vary by voyage and exclude Oceania Choice, Oceania Exclusive and Executive Collection. 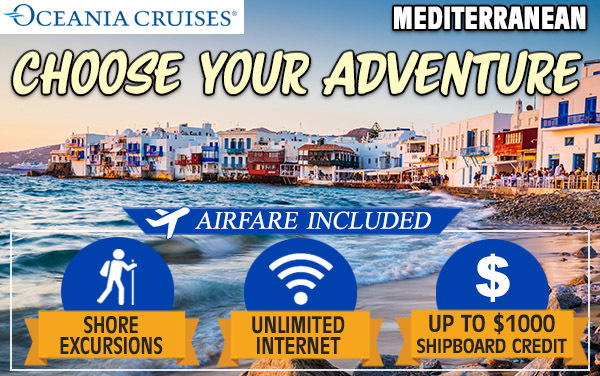 Voyages up to 9 days receive 4 free shore excursions; 10-13 days receive 6 free shore excursions; 14+ days receive 8 free shore excursions. 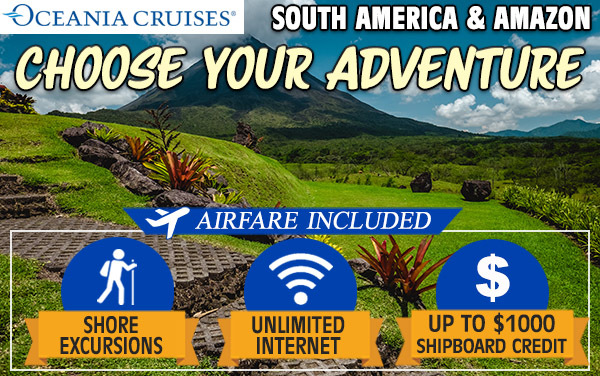 If shore excursion amenity is selected, all excursions must be chosen at least 14 days prior to sailing. 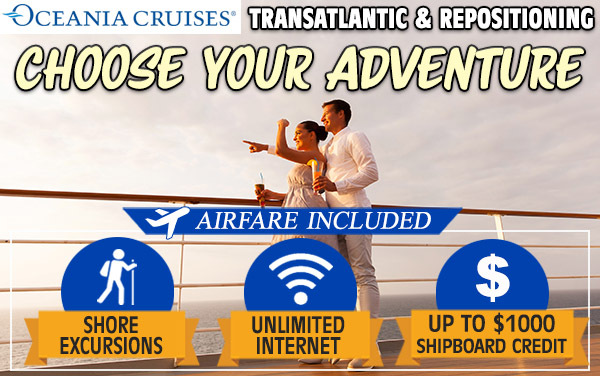 OLIFE SHIPBOARD CREDIT: OLife Choice Shipboard Credit amount varies by voyage length. 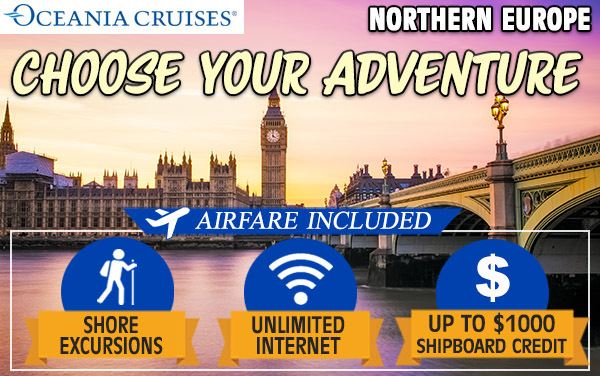 Voyages up to 7-9 days receive $400 Shipboard Credit per stateroom; 10-13 days receive $600 Shipboard Credit per stateroom; 14+ days receive $800 Shipboard Credit per stateroom. 1. 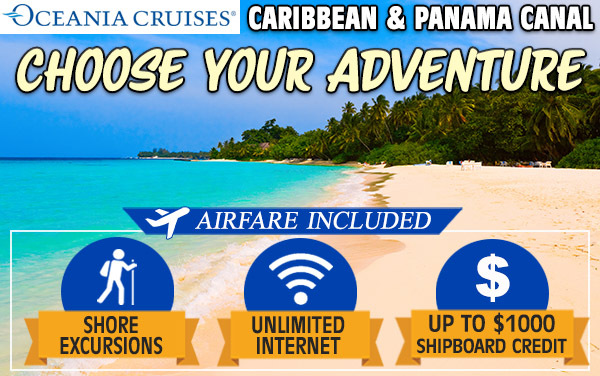 Call us NOW at 800-493-6609 and speak to a cruise specialist. 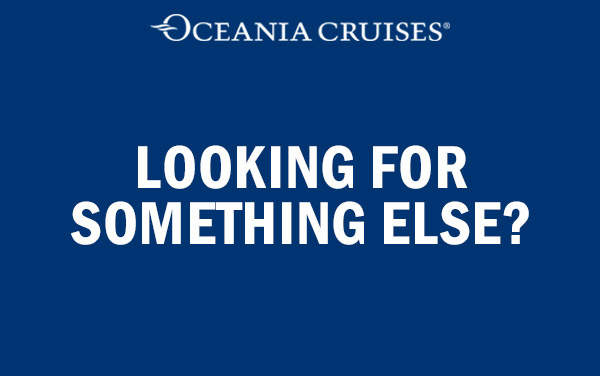 When in doubt, call a cruise specialist... they have all the answers. 2. Book online by clicking the "BOOK IT NOW" button next to your desired sailing. When booking online, you will receive a confirmation of your reservation within 10 minutes of completing the booking process. You will also receive a separate email from one of our customer service reps on the next business day, detailing all your booking perks as these are manually added to your reservation. You can call our Customer Service Dept. 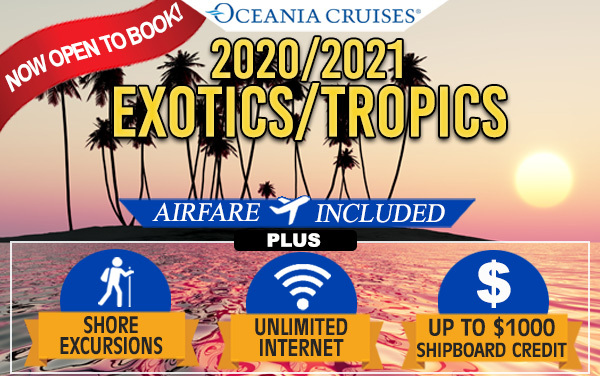 at 800-493-6609 with your booking number and they can confirm your perks as well as answer any questions that you may have. If anything is not to your satisfaction at that time, you may cancel your online reservation without penalty within 24 hrs. 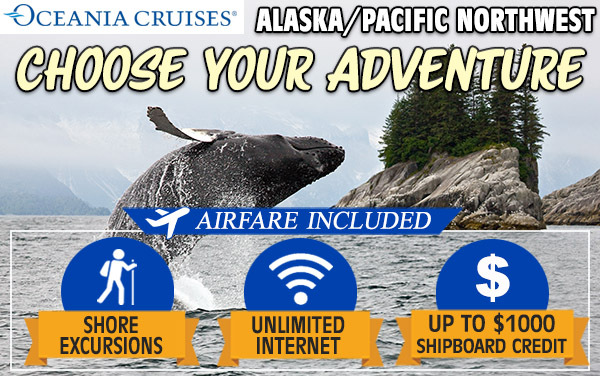 as long as it is before the cruise line's penalties begin. 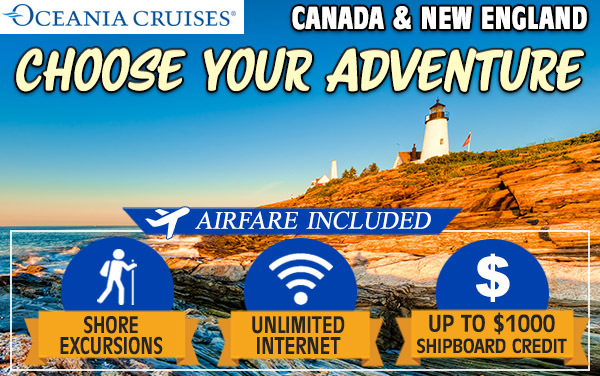 NOTE: You must input your air gateway and request "air included" for an accurate online request, else the system will automatically default to cruise only pricing and apply an air credit instead. Savannah, Seattle, Tampa, Vancouver, Washington D.C.